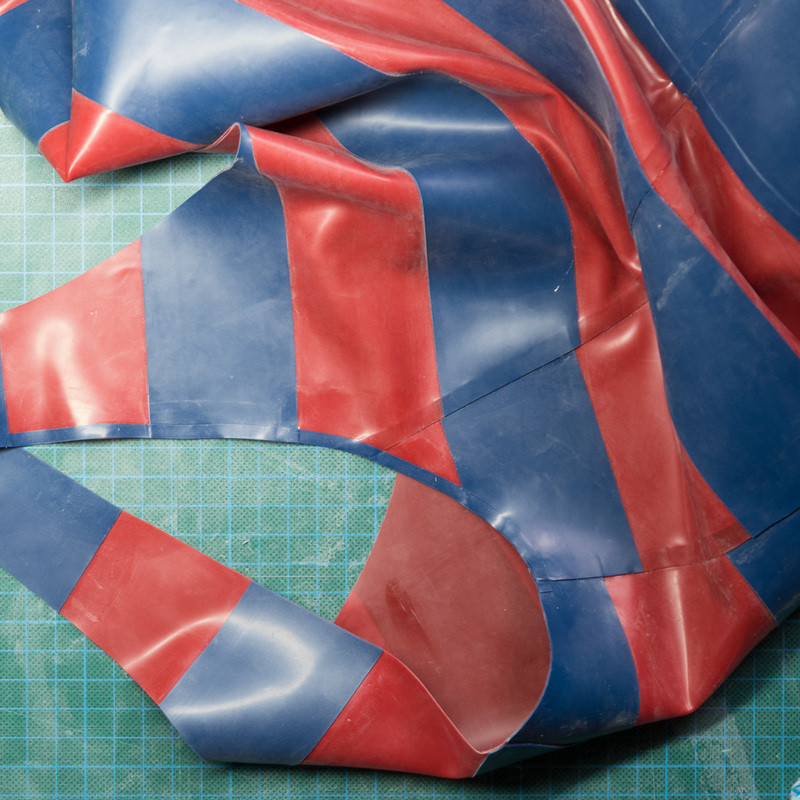 The trick with contrast trim piping is cutting a very consistent width in the latex. The preparation of the trim is the hardest step, applying the trim neatly by hand is fairly straightforward. 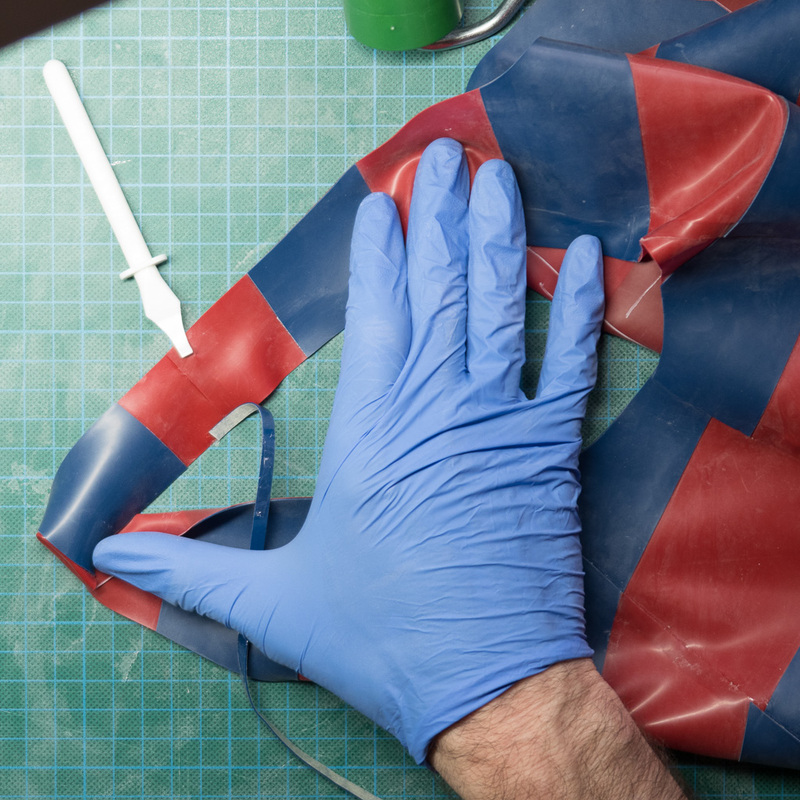 Use a thin gauge latex if possible, ideally thinner than the surface that will receive the trim. Decide what width the trim should be, 4mm is a good start, but scale accordingly to your project. You can apply trim temporarily to your project by cleaning both surfaces but not using glue. The surfaces will tack sufficiently for you to be able to judge what thickness of trim to use (and to try different colours). 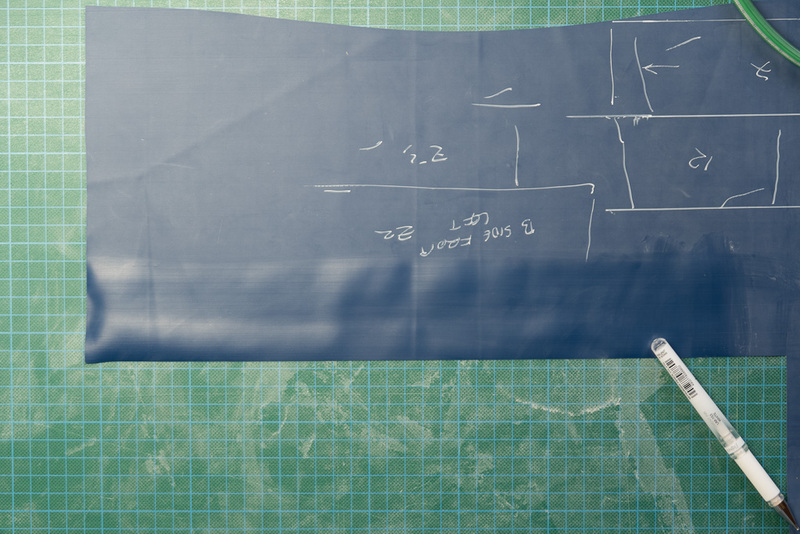 Work out what total length of trim you need; allow some extra in case of mistakes. There will also be a small overlap between lengths, so allow for this. 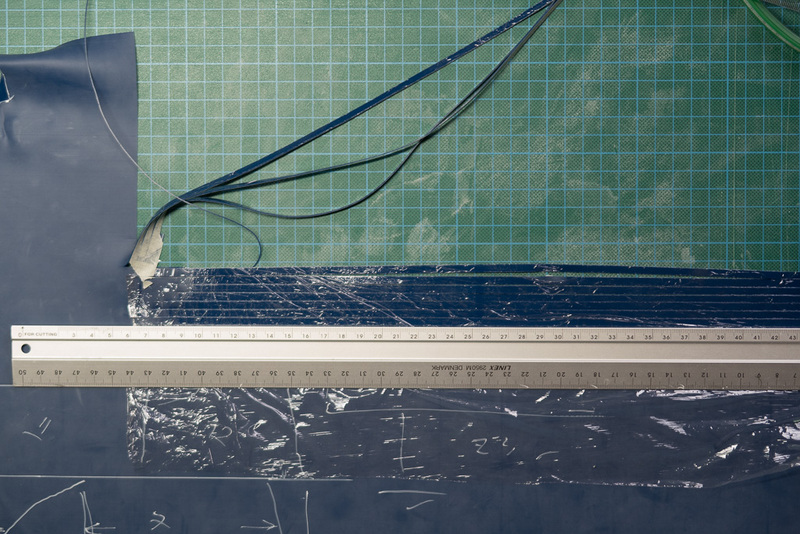 The longest practical length will be determined by your cutting ruler. 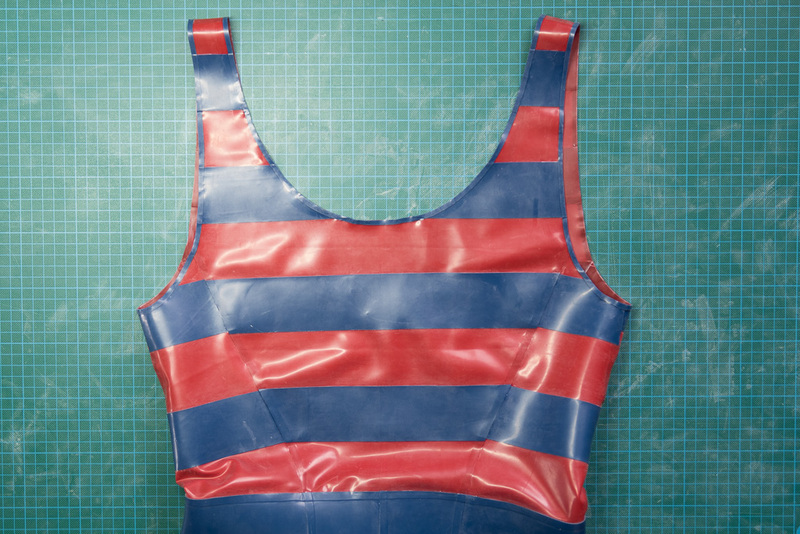 ii) it prevents the latex from stretching when you apply it to the receiving surface. The first of the points above is critical to achieving perfectly parallel cuts. Apply glue using a wide applicator (e.g. at least 25mm). This makes it much easier to get a very thin and consistent layer of glue. Ensure that are no gaps in coverage. 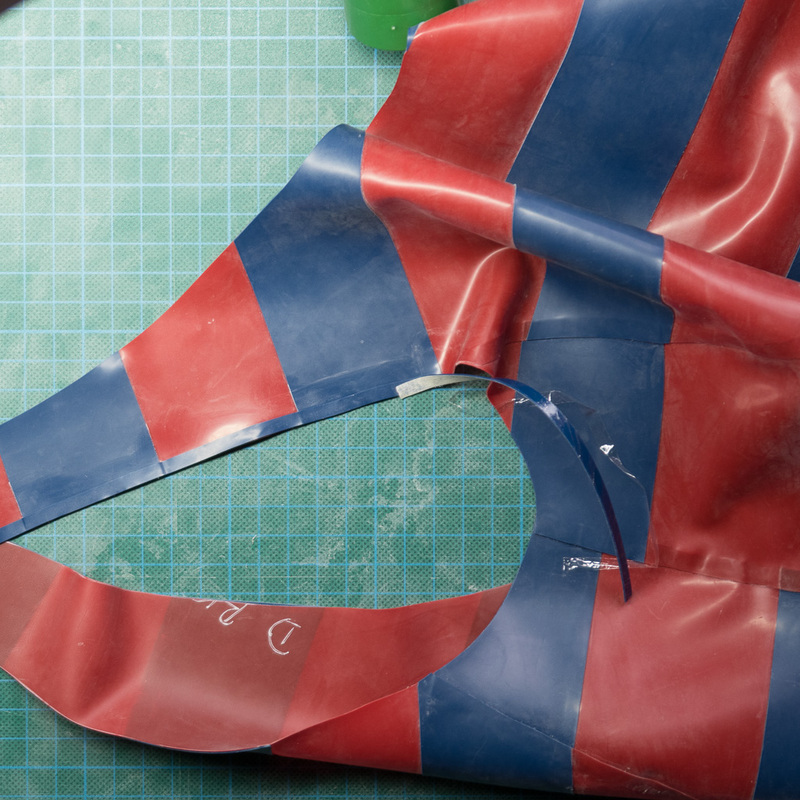 We will only be gluing one surface, so there cannot be any flaws in your glue coverage. Once dry (should be seconds if the glue layer is thin enough), use cling film on the glued side. The cling film will protect the glued surface until it is applied. Then mark out the widths. Don’t draw lines, just accurately mark dots at both ends. The ideal ruler for this purpose is one which is transparent and has parallel markings. Carefully cut with roller cutter and the cutting ruler. Any deviation from a perfectly straight edge will ruin two lengths. Ensure that your body position will allow you to complete the cut consistently in a single pass. 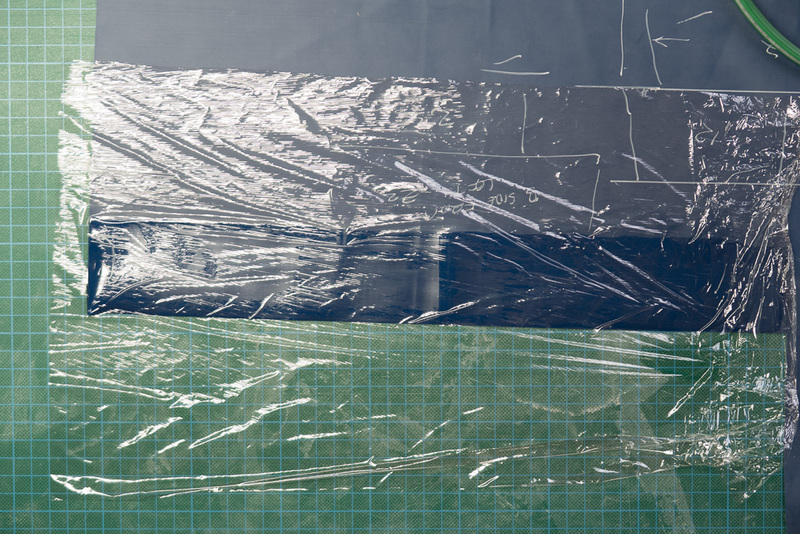 You should now have lengths of trim that have masking tape on the shiny side and cling film on the glued side. 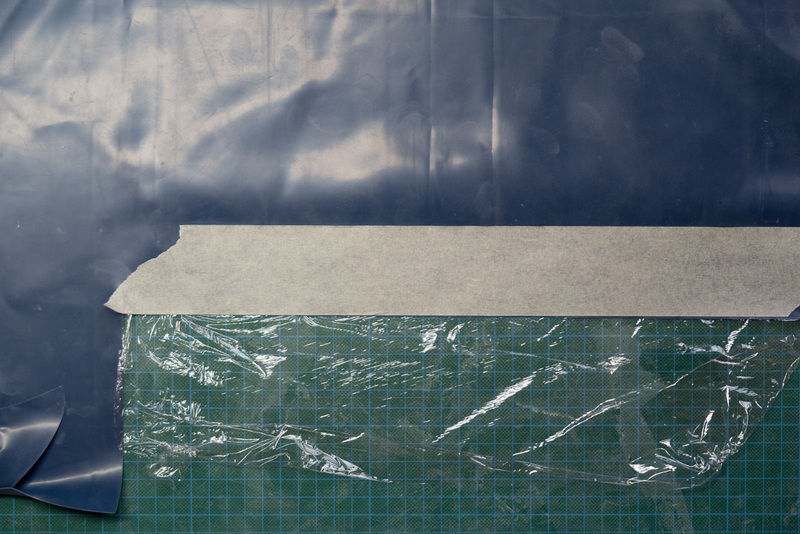 It would be quite tricky to apply glue to the surface that is to receive the trim neatly – i.e. without any glue showing. As it happens, as the trim will not be under much stress, I find that it is not necessary to glue both surfaces, though i normally apply a small amount of glue onto the receiving surface at the start and end of each length. Clean the surface that will receive the trim. 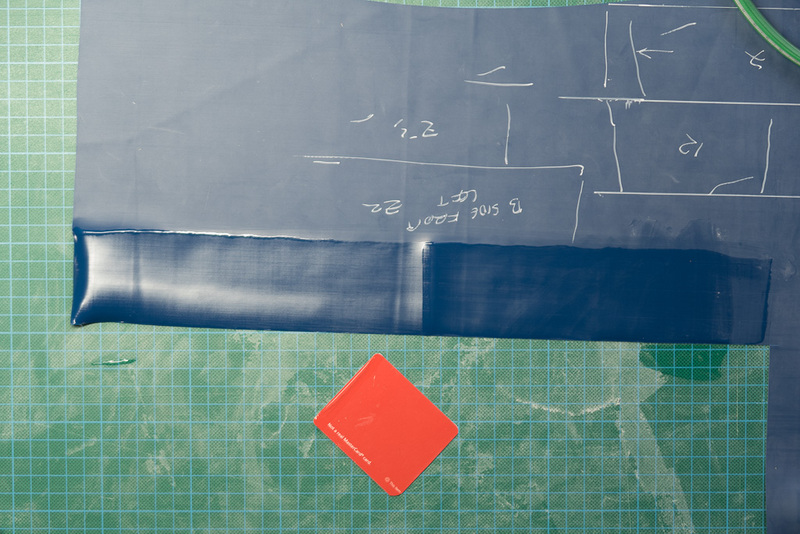 There is no need to apply glue to the receiving surface. Ensure you have good light and arrange the receiving surface so that it is as flat as possible. Apply the trim carefully by eye. Attempt to get a perfect alignment, but if you do error in either direction it is better to have the trim slightly overlap the edge than fall short – but aim for perfection. Remove the cling film from the glued side only as required. The masking tape will prevent the trim from stretching (which would affect its width) and constrains its path slightly which makes it easier to follow the desired path. Until rollered the trim can be carefully lifted and re-layed if you go slightly off. Once the trim is layer perfectly roll firmly. Remove masking tape carefully. When starting a new length of trim use a small overlap and apply glue to the top of the trim you are overlapping. When the trim passes over a seam, use a little glue on the receiving surface and ensure that the trim tracks over the trim correctly. The instructions above apply to applying trim to straight, or slightly curved edges. If the path to be followed has a tight radius then applying straight trim may not give a perfect result. What constitutes a tight radius? That depends on the relative gauge of the trim and main material and on the width of the trim. For tight curves it may be better to prepare the trim either with the exact shape of the receiving edge (i.e. from the same pattern piece), or using a circular rotary cutter with the average radius.